We’re able to recycle more things now than ever before. Entrepreneurs continue to come up with innovative processes that promise to keep expanding the list. The latest recycling innovation is a new Kickstarter campaign I recently found called “ReCORK: Imagine Carbon Negative Footwear”. 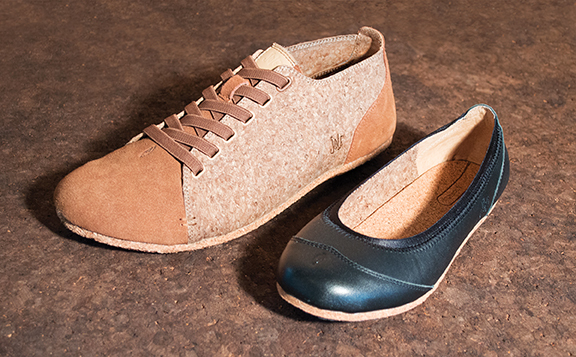 ReCORK promises stylish footwear for men and women made from recycled natural wine corks. Think packaging and chances are bubble wrap comes to mind. There are other, greener alternatives on the market, including Geami, a honeycomb-looking, paper-based wrapping that’s an effective choice. But a new, more natural option has hit the market that might just capture your imagination. For many, the idea of composting conjures up a picture of smelly, insect-attracting, decomposing food leftovers. And although more people than ever are planting home gardens, taking the next step into composting can still be daunting. Full Circle – a two-year old company with an ever-growing line of top quality, functional, eco-friendly products made from sustainable and renewable materials – has created two new products that will make composting easy for everyone. For more on these remarkable eco-friendly in-home compostors, see http://bit.ly/nvz4k2. As we move closer to Christmas,with thoughts turning to presents and lists, there are some important ecological facts to bear in mind. Americans generate an added 5 million tons of waste during the holidays. Of this, four million tons are wrapping paper and shopping bags. Worse still, the majority of holiday wrapping paper can’t be recycled because it contains lead and/or metallic materials, which are toxic if burned. So it all winds up in our landfills. This is a guest post by Danielle Brycz from Verde Lifestyles, an online eco-friendly home décor store. When I think of green technology for the home, my mind jumps to energy saving devices and appliances. But there’s so much more! Most of the products we use have eco-friendly alternatives. Take your daily routine. You wake up, hit your alarm clock, turn on your bedside lamp. Then you shower with a low-flow showerhead, blow-dry your hair, eat breakfast, and are out the door with your backpack or briefcase. Besides conserving water and turning off your lights when not using them, did you consider greener options the last time you made a purchase? It’s just a matter of making small changes. Here are some great green gadgets for the home you might not have considered. MiniWiz’s indoor/outdoor lamp – introduced at 2009’s Consumer Electronics Show (CES) – uses solar technology to provide light. Their SolarBulb can be attached to any plastic bottle. Its LED light automatically turns on when dark and is water-resistant. You can fill the water bottle when it’s windy. Though not currently available for sale, it will be priced around $25. There’s an adorable clock from Bedol that’s powered by water and a little lemon juice. This mixture charges the clock for up to 6-8 weeks! Another favorite is a dirt-powered clock by designer Marieke Staps. Its copper and zinc electrodes go directly into the soil for a natural source of energy. Not only is the power renewable, the clock’s made of bamboo, making it one of the most eco-friendly clocks I’ve come across. Another bonus is you can use any type of plant to power the clock! While its hard to believe, this Barbar dryer cuts both your drying time and energy consumption in half! Plus its ceramic heating components protect you from radiation. The cover doesn’t appear to be sustainable, but it’s a step in the right direction! The Voltaic solar panel backpack has been on my wish list for a long time. It will charge all your devices, even rechargeable batteries. (Not all at once of course.) Fully charged in 6-8 hours, it comes with an adaptor to charge at home or in the car. Another bonus: the wire channels bring power to the shoulder straps for easy use and there’s a plug for headphones. It’s a little more expensive than your average backpack, but well worth it. If you’d rather have a messenger bag than a backpack, the NoonStyle Solar Messenger Bag is for you. Same concept, different style. Though stylish, a big drawback is it’s almost double the price of the Voltaic backpack. Developed by Tammock Trading, the Solar Grill is the first of its kind. Made of concave metal coated with a mirror, it focuses the sun’s rays to cook your food. While not practical for cloudy days, on sunny days it’s powerful enough to burn your food! For $240, this nifty grill’s great for camping or the beach. Compared to other eco-friendly grills, this product takes it to the max! These are some of my favorite eco-friendly products. Feel free to share yours! Volvo announced plans to test Dimethyl ether (DME), a cleaner burning fuel sourced from renewable materials, in some of their trucks. DME isn’t new, but its impact on the environment is impressive. This colorless, clean-burning gas has the potential to be 95 percent carbon neutral, with zero particulate emissions According to Wikipedia, as a fuel source DME shows promise for diesel, standard gasoline and gas turbine engines. The DME for the Volvo project will be an energy-rich, highly viscous by-product of the paper pulp industry. Volvo plans to have selected customers test 14 of their trucks at four locations in different parts of Sweden between 2010 and 2012 at four Preem oil company stations. To learn more, check out the video.